Altitude range: 540-860 metres above sea level. Habitat and Ecology: It grows in Succulent Karoo on the edge of steep quartz cliffs. Description: Conophytum auriflorum subs. turbiniforme previously known as a distinct species is one of the ecotypes of Conophytum auriflorum. It is distinguished from the latter by larger, flatter turbiniform grass-green bodies dotted with green and never with red striations, moreover it has longer and thinner petals. 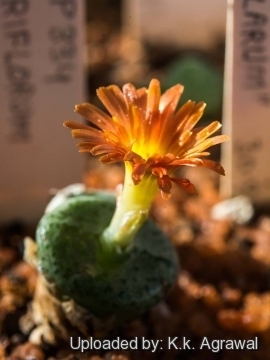 This subspecies may be a product of introgressive hybridization with Conophytum ectypum ssp. ectypum and/or Conophytum flavum ssp. novicium. Habit: It is small densely branched perennial-succulent that forms low compact cushion but loosening in age as some heads crane their necks. While the small autumn flowers are already fully developed here, the new leaves are lurking inside the papery husks of their predecessors from last season. They still display the withered rest season look of the dry summer. The young leaves will swell out fully from inside them as the winter rain allows. Derivation of subspecific name: The name of the subspecies comes from the Latin “turbiniformis-is-e”, = conical, top-shaped, turbinate with obvious reference. Bodies (paired leaves): Turbiniform (inversely conical), apex truncate, slightly concave to convex, 10-18 mm tall, 3-8 mm wide and thick fissure 1-3 mm long, minutely papillate, surrounded by a dark green band.. Epidermis glabrous, slightly tender or translucent, pale green to reddish-green when newly emerging, often suffused reddish-brown at the margins, sparsely dotted with green or vaguely striate but not striate with red. Sheath whitish to pale brown, semitranslucent, brittle but persistent. Flowers: Bright yellow, rarely orangish, diurnal and scentless Petals long long narrow. Conophytum auriflorum Tischer: (subsp. auriflorum) has bodies convex at apex, grass-green to reddish, unspotted or sparsely dotted or with a few wide translucent streaks but never regularly striate. Fissure translucent. Distribution: Komaggas and adjacent areas. 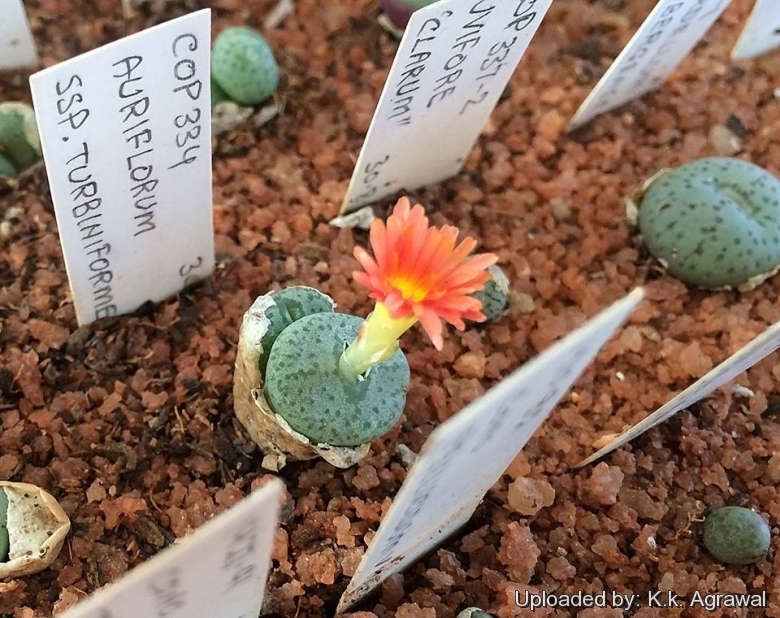 Cultivation and Propagation: Conophytum auriflorum and its varieties are among the most popular of this genus but relatively difficult to grow. These plants grow on winter rain and head for summer dormancy. The growing season in northern hemisphere is from September to March. During this period they can be lightly watered about once a week or (better) misted every day and will become plump. In Africa, the mist from morning fog provides moisture. Otherwise their epidermis breaks (resulting in unsightly scars). Water minimally in summer, (only occasional misting). Start watering again in autum after the previous year's leaves have dried up. Require good drainage. They enjoy full sun or half-shade and in summer they need to be kept in a cool area. Hardy to -2°C. Ensure a very good ventilation. Avoid to repot frequently. They may stay in the same pot for many years. Plants grown in larger containers have frequently relatively poor flowers. They might improve when the plants are given their own, small individual pots. Propagation: They can be reproduced both by cuttings and seeds. Seed must be sown in the spring or summer. The seedlings should not be disturbed until they are well rooted, after the first or second year they should be big enough to separate and be planted into their own pots. Take the cutting from a grown-up mother plant. Each cutting must contain one or more heads along with a fraction of root.